One of the major problems for gamers is the fact that the best gaming hardware is usually confined to their home desktop. So gaming on the go is a hit-or-miss affair. And that’s why services such as Steam streaming or HP’s Omen Game Stream app come into play. And Nvidia is also throwing its hat into this ring with GeForce Now for Windows. In case you remember, last year around the same time, the company had announced GeForce Now game streaming service for Mac. From his week, it will be available for Windows 10 users as well. Nvidia GeForce Now provides gamers with the ability to stream gameplay rendered remotely. This eliminates the requirement of a powerful PC locally, and all you need to worry about is having a good internet connection and meeting the minimum system requirement. Nvidia recommends download speeds of around 25mbps. So essentially, the games are processed and rendered remotely at one of Nvidia’s many data centers across the U.S. and provide a graphical output similar to that of the company’s GTX 1080 graphics card. 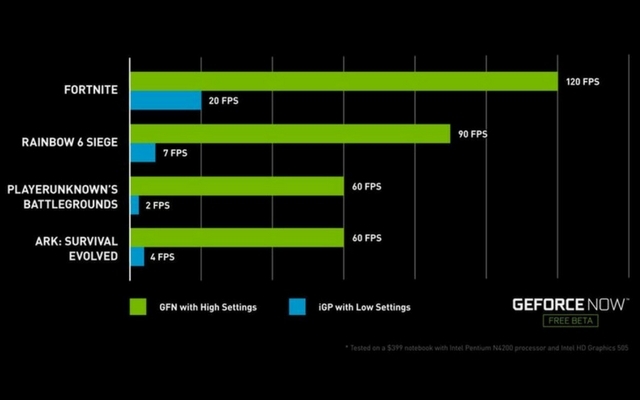 GeForce Now has a ton of benefits as well. The first and foremost being no loading times. Nvidia stores a cached version of each game available on the platform, so they’re ready to go when required. Another advantage is game syncing service. This will allow you to start a game on one device and carry on with another device. In addition to all this, Nvidia is also importing Steam game collections into the GeForce Now service for Windows. This is great news for Windows PC gamers as it will allow the players to play a roster of games on an underpowered laptop or PC that wouldn’t normally handle such titles. That being said, the service is currently in beta and Nvidia is yet to announce the pricing and availability of the final version. Meanwhile, you can head over to Nvidia’s website and request access to be a part of the beta.